OOPS! : What the heck is OOPS and how do I join the FUN? What the heck is OOPS? 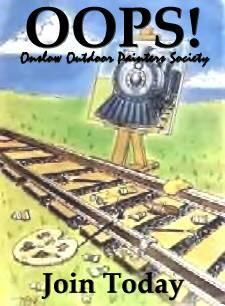 OOPS is short for Onslow Outdoor Painters Society. OOPS is a gathering of artists from Onslow County, North Carolina, with one purpose... carrying on the tradition of painting "En Plein Aire"... a French term literally translated "In Open Air". We have no officers, no membership dues, no by-laws, etc... we simply gather on appointed dates for "paint outs" enjoying the fellowship of like minded individuals sharing the same passion... plein air painting. Simply show up when you can with your painting gear and join in on the fun. If you are under the age of 18 and interested in joining we ask that you are accompanied by a parent or guardian. We gather at "Paint Outs"... dates and locations (within the county) predetermined where we simply fellowship and PAINT! "Paint Outs" occur approx. once a month... usually on a Sunday afternoon. A list of these "Paint Outs" is listed in the side bar of this blog. What is a "Paint Out"? Paint Outs are locations... usually within Onslow County... where we gather to paint. The location is usually picked out and organized by various OOPS members. Several of our outings are annual events like "The Banks Party" and the "Arts by the Sea" festival... but for the most part... we paint at different locations each month. We do venture out of the county once in a blue moon for special paint outs. Each artist is responsible for bringing their own gear. We usually meet around 1:00 PM (some artists show up earlier) and paint for a few hours. Sometimes after our paint out we meet at a local restaurant for a dutch treat dinner and discuss the days painting adventure... this is always optional. A complete list of our Paint Out dates and locations is listed in the side bar of this blog under the heading "Paint Outs". What if I have never Plein Air painted before? No problem... join in on the fun anyways! Many of our members never plein air painted before they joined OOPS. Ask any of them about the benefits of painting from life and they are sure to tell you that they all have become better artists since joining OOPS. Take a chance... become a plein air painter! Do artists teach at these outings? The paint outs are not times of instruction but one can gain a wealth of knowledge from watching any of the artists paint. Seeing how each artist uses different techniques, etc., is a great learning tool. It is always cool to see how each artist sees and renders the same scene differently. All skill levels are welcome to join us. Our group has every skill level represented... from children to artists with gallery representation. Many artists paint for fun and relaxation while many strive to hone their skills. One thing for sure... there is never an aire among the OOPS artists... we are simply a GREAT bunch of like minded people sharing our time and talents with each other which have built lasting friendships. You are sure to feel at home with us! Be sure to check out the Tips, Techniques, Demos, Videos, and Info for Plein Air Artists section in the side bar for some great info about plein air painting. This will help any plein air newbies get acquainted with what to bring to a paint out, etc. Once you have joined us for a Paint Out or two we ask that you submit a short artist bio and photo so we can include it on our blog. Last but not least... click here... Subscribe to OOPS! by Email... to subscribe to this blog for all future details and updates. Once you subscribe... you will be sent an email automatically when something is posted on this OOPS blog. See you in the great outdoors! Looking forward to meeting you in person Veronica... you'll love the OOPS bunch! Had a great time at my first "paint-out". The company was great and I am inspired to continue and do better! Thank you, looking forward to the next gathering.